The turbo is standard on the Titanium model, but the base S model starts with a 168-horse 2.5-liter I4 and an incredibly peppy 2.0-liter turbo I4 is available for $1,295 extra. It boasts 245 horses and a 275 torque rating. For most of us, the smaller turbo will do. And it boasts fine fuel economy, rated at 23 mpg city and 30 mpg highway by the EPA. I got an impressive 28.9 mpg in about 60% highway driving. 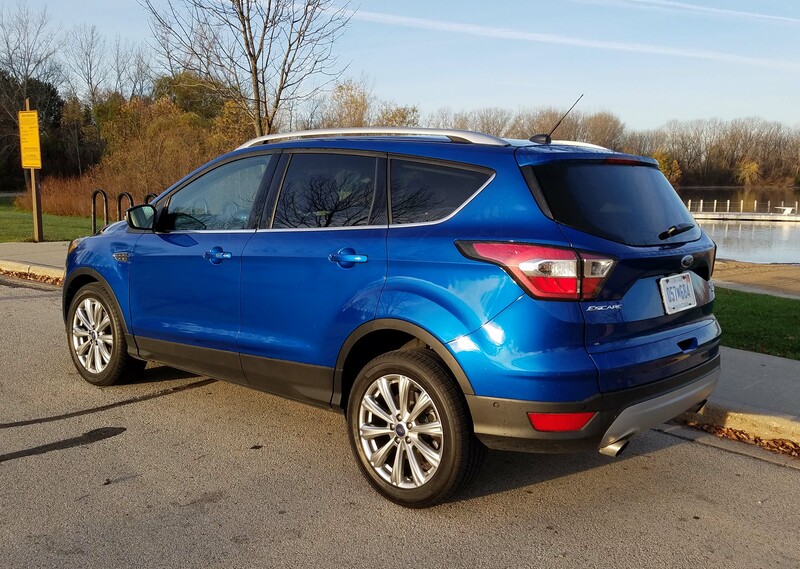 Likewise Escape continues as a sporty handling crossover. There’s good steering feedback and handling is responsive. Putting the Escape through some quick moves on twisty roads was fun and there’s little lean in corners. This too was a front-drive model, so no power going to the rear wheels. 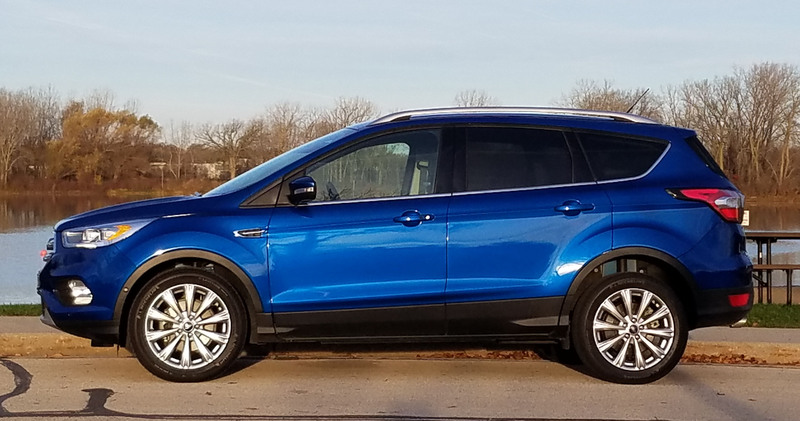 That’s another mark in Escape’s favor, its ability to be ordered as either FWD or AWD, the base S with FWD starting at $24,495 including delivery. Up a level, the SE starts at $25,995 and with AWD moves to $27,745. The tested Titanium model starts at $29,100, plus $895 delivery. Overall that’s a drop of $405 from 2016 models. Adding AWD to Titanium puts it at $31,745 in a market where the average new vehicle is running $34 grand and change. Value is high with Escape. Is it perfect? Heck no. Escape rides on a 105.9-inch wheelbase that gives it a decent ride, mostly. 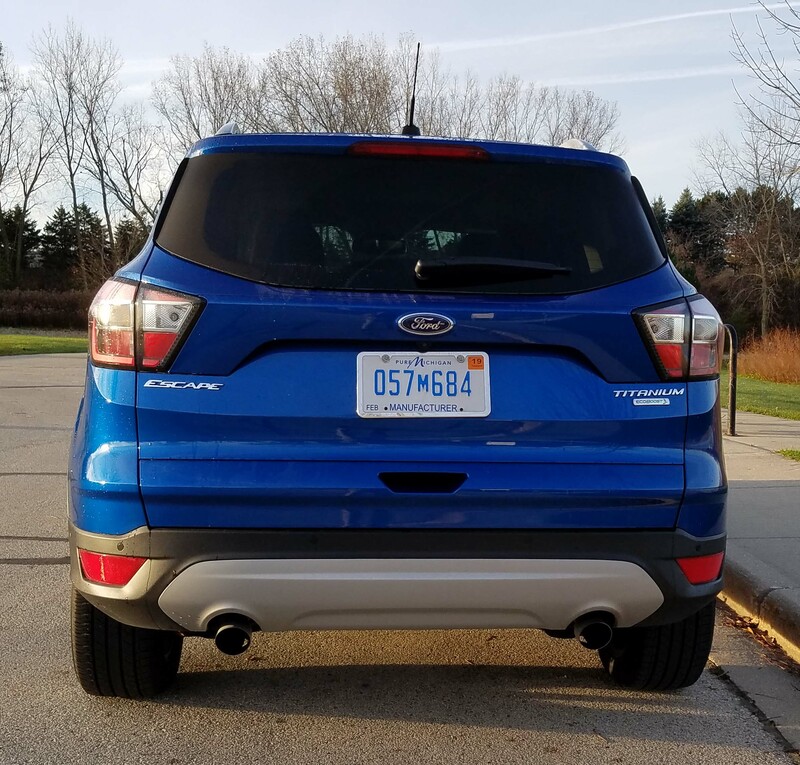 But it can become jiggly on Wisconsin roads, those with a lot of expansion joints or tar patching strips across the pavement can make the Ford just a bit bumpy. 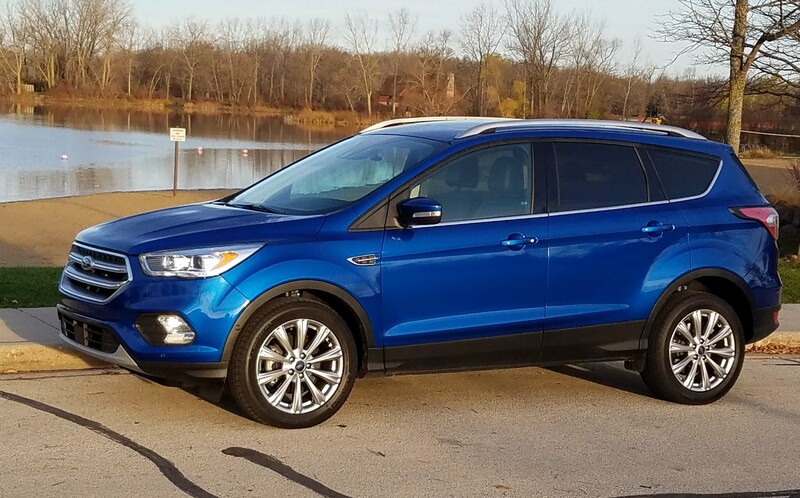 My bright blue test Escape was sharp looking and the 2017’s interior has been upgraded. The Titanium model comes with leather seats standard, along with power front seats, remote start and a power hatch. These were black leather with gray stitching and were well formed. The seat backs were contoured to fit your back and hold you in place while the seat bottoms were flatter, which is good for larger drivers with wider hips. The test vehicle had a black dash with black gloss trim and a new edgy look that took some getting used to as there’s a hood over the radio/nav screen top center of the dash, plus hooded main gauges. I like their look and the bright turquoise dial needles are easy to see too. There are three seat memory buttons on the door and the test Escape came with heated front seats, while a Titanium technology package at $1,995 added a heated steering wheel, enhanced parking assist, lane-keeping system, rain-sensing wipers, collision warning and braking, automatic high beams and a supplemental PTC heater that assures you have warm air flowing from the heat vents immediately after the vehicle is started. Other add-ons included adaptive cruise control ($595), a navigation system ($795), and panoramic sunroof ($1,495). All that pushed the price of the test unit to $34,875, still about average for a vehicle these days. But even the S model comes with a tilt/telescope steering wheel, keyless entry and rear-view camera. 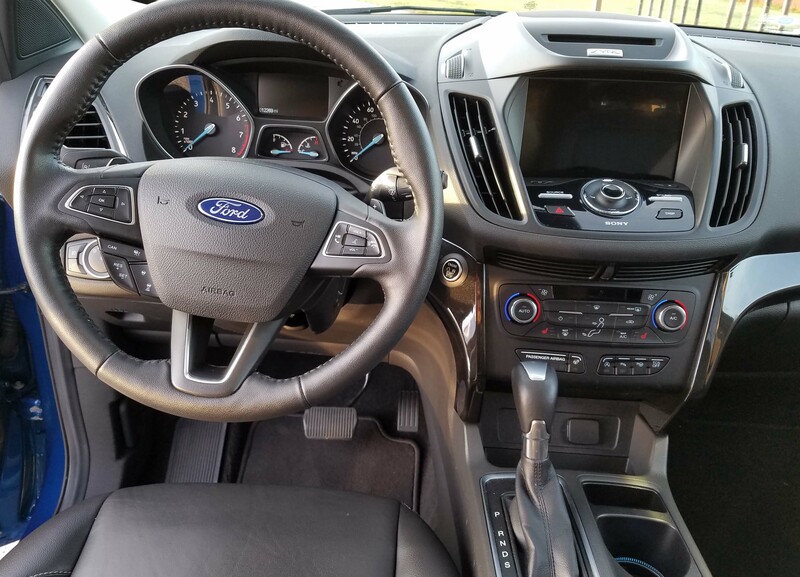 Moving up to the SE adds a dual automatic climate control system, alloy wheels, power driver’s seat and paddle shifters that you’ll likely never use. The Titanium model adds a 10-speaker Sony sound system, the power front seats and leather interior, plus remote start and the power hatch. Also standard is Sync3, Ford’s latest infotainment system and it works pretty well. It also includes Android Auto and Apple CarPlay systems to allow you to sync up your smart phone. Both a 12-volt and USB port are standard. I like that there’s a blind-spot warning system too. But the buttons on the tilt/telescope wheel are mighty small and easy to bump or confuse. Likewise, buttons for the climate control system are rather small. I find Escape’s A-pillar and side mirror combo large. That can cause side visibility problems, while the rest of the vehicle has good sight lines. I also feel compelled to mention the extremely long key fob, which feels like a small brick in your pocket. Rear seats are roomy and extremely comfortable for a couple adults, while a third will fit if needed. The rear seats also quickly fold flat with the pull of one lever on each rear seat’s side. That doubles the cargo room to about 68 cubic feet, making Escape a fine hauler when needed. The power hatch also works well and makes loading easy. The wiper on the hatch is a big plus in winter. 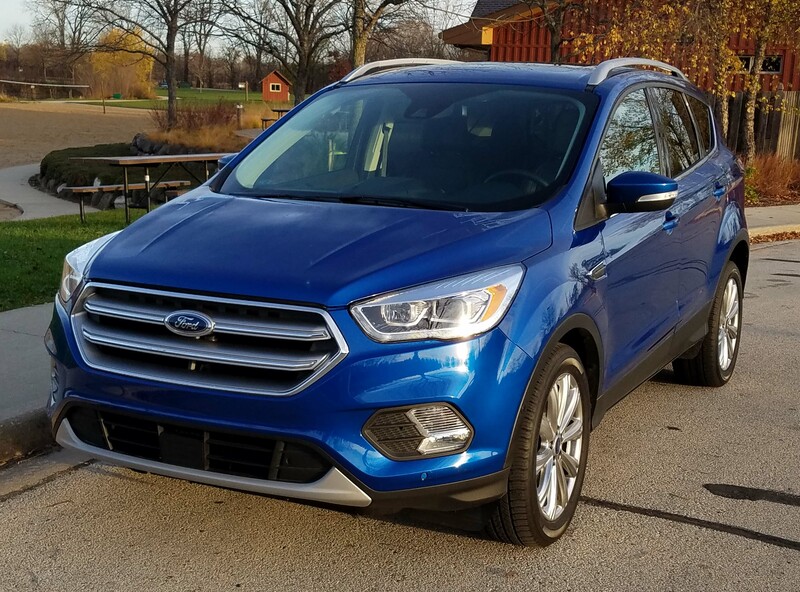 Note too that the Escape will tow up to 3,500 lbs., tops in its class. Escape remains one of the top values in the small crossover class, strong on power, handling and fuel economy. This should be on your shopping list if you’re looking for a family value vehicle. Hits: Good acceleration, handling and shifts. 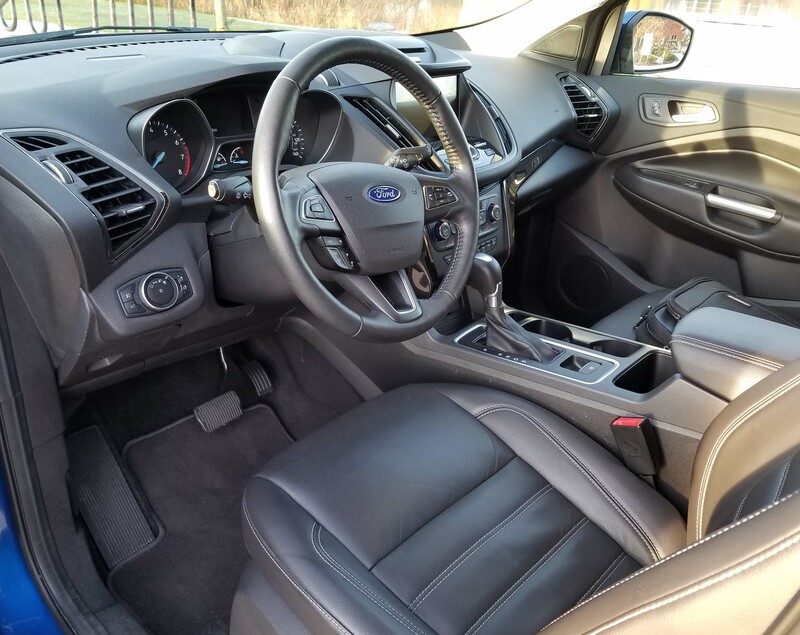 Heated seats and steering wheel, big sunroof, blind-spot warning, rearview camera and comfy interior for four adults with comfy seats. Power rear hatch, big cargo room and impressive gas mileage. Misses: Small buttons on steering wheel hub and for climate controls, giant fob, thick A-pillar/mirror combo blocks view and a somewhat jiggly ride.